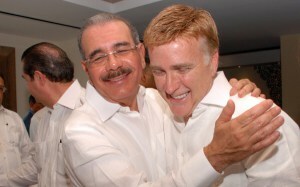 The President of the Dominican Republic, Danilo Medina, is often accused of cowardice by netizens of the island, who derisively refer to him as "Danilo Gallina," or Danilo the Chicken. After years of getting hounded by the US ambassador to the country on everything from gay marriage to open borders, Mr. Medina finally stood up to for himself and the country, publicly rebutting accusations made by Ambassador Brewster that the Dominican Republic was becoming and even bigger "drug bridge." Mr. Medina caused a shockwave on the internet when he told the media that if the Dominican Republic was a drug bridge, then the US was a "ten-lane highway." Nonetheless, America's ambassador yields extreme influence in a small country that the US twice invaded and occupied in the 20th century, with the State Department recently putting pressure on the Dominican Electoral Commission to grant birth certificates to the children of undocumented migrants by taking away the US visa of the Commission's President, Roberto Rosario. In the same interview with Noticias SIN during which he made the offending remarks on the DR increasingly becoming a drug bridge, Ambassador Brewster also claimed that corruption was overtaking the Dominican Republic. Mr. Medina asked Mr. Brewster to point out the specific cases of corruption which went ignored, and today Sunday he has received a response from the ambassador: "We hope to continue collaborating." Essentially, the US Embassy in Santo Domingo will continue putting pressure on the Dominican government to legalize the child of anyone who pops into the DR, and Mr. Brewster will cry "corruption" if the country's immigration agents begin setting up checkpoints and enforcing the decisions of the people's courts. Until we see undocumented immigrants being deported, we'll know that this latest kerfuffle is nothing more than rhetoric on the part of the Dominican president. Mr. Medina is only in charge of some aspects of the Dominican government; he's still too reluctant to wrestle the Ambassador for control of immigration, and until he does so, the Dominican Republic will continue being nothing more than America's back-beach.